Calibre 504 Omega 18k gold Constellations aren't all that common, only 25000 pieces having been produced across a range of metals and dials. Black dialled calibre 504 models are in a different league altogether, with less than a thousand believed to have been manufactured. Generally in the 1950s, black dialled models were a ‘special order’ watch and so, today, with the resurgence of interest in, and popularity of, black dialled Constellations from the nineteen-fifties and sixties, serious collectors hanker to have an example in their collections. 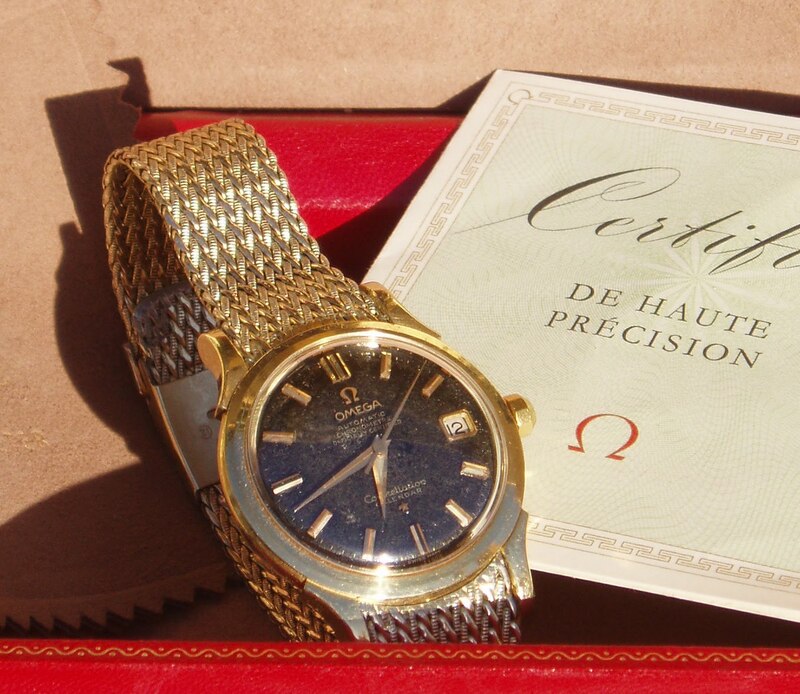 "Although I was very inexperienced with buying watches, I had always wanted a gold “Constellation” and having had since I was 17 a Speedmaster Professional (1970), when I saw this watch with its “black face” I had to try for it and I was lucky enough to succeed.!" John continues, "" I spent some time on your excellent web site and became satisfied it was real. Sometime after receiving it, the seller sent me the watch’s original watch box, Certificate of Chronometre and original purchase documents, being receipt and guarantee showing a purchase date of 2/9/1959. It still has the original sheets of carbon paper showing the type writer imprints between the pages! The seller says the old gentleman who was the previous and original owner brought them in after the sale and “thought I might like them” and they then sent them on to me as a gift!"" What a superb eBay story. I hope you have a bottle of quality whiskey on the way to the original owner, John, because his generosity has probably added between 700 to 1000 dollars to the value of your purchase. Original box and papers provide watches with provenance and provenance is very important, particularly with very uncommon watches. You now have a magnificent piece, together with original box and papers. It would be charming if you could communicate with the owner and obtain some background to his purchase. It would add a wonderful touch to a piece that I hope will become an heirloom in your family. Above are some pictures of John’s find. Click on the pictures for an enlarged view. Nice fins d especially with original box.I recently acquired a 58/59 cal 504 2 tone black dial connie calendar serial no 165675XX case 2943 4 SC. Nice to see my gut feel was right. 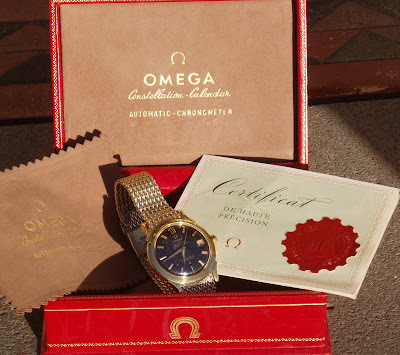 See my post in watchuseek omega forums 30 august 2011 for pics. 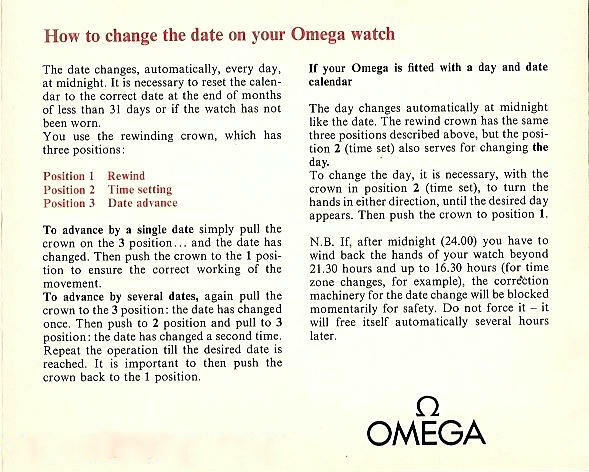 Also to add to the controversy around the decathon crowns mine has the seamaster type which the original owner says came with the watch when purchases new. Yes, the clover leaf certainly appeared on a numb of Connies, particularly the cal 504, and more particularly on US models. While I would argue that the Constellation standard design story included the decagonal crown, I also acknowledge that there were variations, the clover leaf being the most consistent of such variations. Sound like you have Avery nice acquisition. I've just inherited my Dad's Constellation. A black dial 504. Not gold, but gold over stainless steel. One or two things worry me: in one of your other articles I read that the observatory logo on the back should show the brickwork. This one doesn't.Probably not a Swiss-made case then? Also I'n not sure about the serialnumber: the 504 dates from 1957, the serial is 17071979, indicating 1959. Is there an explanation for this? Hi You have a very nice heirloom there. Brickwork observatories were for solid gold Constellations until around 1966 when the designs were reversed, and so your case back is fine. Serial of 17 million on a caliber 504 is certainly kosher as these movements were produced in 57 and continued until the 561 was released in late 59. Are you sure the watch was purchased in 57? Seems early for a fully presented 504. I deducted the possible 1957 from the 504 caliber. Date of purchase was either before 1959, or between mid '61 and early '63. These dates coincide with the family being abroad or in the Netherlands. My guess is the latter. Anybody know about a dial that has a Black Star on the Dial above the constellation on a 504 Model if it was made by the factory as a replacement? I have never seen the star above Constellation and believe that any such configuration would be 'artistic' and not factory. Cal 504 also have the "Calendar" script, both nicely placed above the star.